Results comparable to radiation are just part of expanding its use in inoperable NSCLC. Interventional radiologists are working to move ablation techniques—radiofrequency ablation (RFA), microwave ablation, and cryoablation—to the front burner when treatment plans are selected for patients with medically inoperable nonsmall cell lung cancer (NSCLC). Despite comparable survival rates and several advantages over stereotactic body radiation therapy (SBRT), these minimally invasive treatments remain on the back burner in most of the oncology community. SBRT remains the go-to method for treating this challenging, typically older group of patients. It has been the standard therapy for treating patients diagnosed with stage 1 NSCLC considered to have medically inoperable disease for reasons such as poor cardiopulmonary function and advanced age. However, interventional radiologists, including Damian Dupuy, MD, of the department of diagnostic imaging at Warren Alpert Medical School of Brown University and Rhode Island Hospital in Providence, are offering reasons why image-guided tumor ablation (IGTA) merits equal consideration to SBRT for these patients. Some physicians also see advantages of one ablation technique over others for treating this patient group. IGTA has been found to have a survival rate similar to SBRT's when used to treat patients with inoperable NSCLC, Dupuy says. "It also is a single outpatient treatment that can be done at the same time as a lung biopsy and at a much lower cost than SBRT," he adds. Focusing on survival rates, Dupuy points to the findings of a multicenter cooperative group trial that researched the use of RFA for treating stage 1A NSCLC in medically inoperable patients. At two years, RFA patients were found to have an overall survival rate of 69.8%, which was comparable to the rate the Radiation Oncology Therapy Group reported in 2010 for similar patients who had undergone SBRT, he states. The trial, known as the American College of Surgeons Oncology Group Z4033 (Alliance) trial, was funded by the National Cancer Institute and published in the journal Cancer in 2015. Recently, cryoablation has been shown to have a better survival rate for inoperable NSCLC patients compared with SBRT, as well as 3D conformal external beam radiation, in a study published in the Journal of Vascular Interventional Radiology (JVIR) in 2015. The study assessed 47 NSCLCs in 45 consecutive patients between 2006 and 2011. The five-year survival rate was 67.8% for cryoablation, superior to traditional radiotherapy, according to its lead author, William Moore, MD, chief of thoracic imaging and clinical director of radiology IT at New York University Langone Medical Center. Both Moore and Dupuy have reported a number of benefits of IGTA compared with SBRT. "Unlike SBRT, IGTA is usually performed in a single outpatient session and can be performed at the same time as the biopsy, given onsite cytopathology expertise," Dupuy reports in another of his studies, "Treatment of Medically Inoperable Non–Small-Cell Lung Cancer With Stereotactic Body Radiation Therapy vs Image-Guided Tumor Ablation: Can IR Compete?" published in JVIR in 2013. That study also notes that SBRT may require a biopsy and may require the placement of multiple gold fiducial markers percutaneously under CT, which can result in complications such as pneumothorax and chest tube placement. Patients undergoing SBRT also must lay flat and be completely still for longer periods of time compared with IGTA, and will need to go back and forth to the treatment center for four or five more treatments than with IGTA, Dupuy explains. SBRT procedures also may interfere with the electronics of pacemakers that are close to the area being treated, he adds. Tumors near the diaphragm may need to have larger areas of radiation treatment due to the greater amount of respiratory motion during the procedure. IGTA has a poorer local control rate than SBRT, yet these local failures can be retreated effectively with IGTA or SBRT, according to Dupuy. "SBRT has 90% control rates, which is considerably higher than some IGTA devices. IGTA has as high as 40% local failure at two years in some studies, but many of these local recurrences can be retreated effectively with no difference in overall survival between those who recurred locally and those who didn't," he notes. IGTA's poorer control rate is "not surprising," according to the study, "given the differences in techniques (ie, thermal vs ionizing radiation) and the lack of exact treatment margin definition and availability of reliable treatment planning techniques." To consider cost, Dupuy's study took into account Medicare reimbursement information from Rhode Island. In those data, SBRT cost approximately $17,000, while lung RFA cost $5,000. "Cost can be three to four times as much, and if patients have copays, the out-of-pocket costs for them will be higher," Dupuy says. Cryoablation procedures usually require a shorter hospital stay than SBRT, and that can result in a savings in cost, Moore explains, adding that some cryoablation procedures can be performed on an outpatient basis or require only short-term observation periods. Citing another potential benefit to cryoablation, Moore mentions cryoablation's association with an immune response. "This may increase the potential effect of the ablation," he says. Cryoablation works especially well in certain spots, according to Moore. "There are some locations, such as around the aorta, that are uniquely suited for cryoablation," he says. "The freezing mechanism allows the collagen matrix to remain intact, making this procedure safer." The procedure involves some complications, he adds, but those complications are "easily controllable and, typically, short term." Moore's study also compared cryoablation's 67% five-year survival rate with RFA's five-year survival rate for patients in this group, as well as techniques used when surgery is an option (eg, wedge resection, sublobar resection, and video-assisted thoracoscopic surgery [VATS]). The five-year survival rates for sublobar resection and cryoablation were similar, and "compared favorably" between cryoablation and VATS. Wedge resection's five-year survival rate was found to be higher, at 73.6%; however, in the study, the patients had more severe underlying disease evidenced by a lower forced expiratory volume in one second compared with the patients who were treated with VATS. "Cryoablation has an excellent survival [rate] with very few complications, especially compared to limited resection," Moore says. Prior studies found cryoablation to perform similarly to RFA. "Overall, cryoablation shows survival outcomes and recurrence rates similar to the RFA literature," Moore says. Moore acknowledges limitations of his study. The "good" data reported in the series may be credited to "good cryoablation technique and the strict adherence to staging protocols," he says. Yet, he believes the field will continue to develop. "New devices and new data are coming out on a regular basis," he says. One drawback to doing RFA is the potential for local thermal sink effects. With SBRT, there are no worries about thermal sink effects from larger vessels in the lung, which can reduce adequate heating in IGTA, Dupuy explains. Due to these effects, RFA has been said to "lack reproducibility." Microwave ablation, which is newer than RFA, may have an edge over RFA because it experiences less local thermal sink effect, which reduces ablation temperatures, Dupuy notes. "Newer microwave technologies may prove more beneficial in the lung based on their ability to achieve higher temperatures, and they may be less affected by thermal sinks compared with RFA," Dupuy says. Microwave ablation also has improved penetration into aerated margins, he adds. More studies are needed, however, to assess microwave ablation, including any benefits over RFA. "Without a randomized controlled trial between any given MW [microwave] device and any given RF [radiofrequency] device in regards to local control, safety, and survival, we will never know which one is superior," Dupuy says." Despite a lack of trials on microwave ablation, the good results interventional radiologists are getting on their own could broaden its use, he says. "Like most things in medicine, if practitioners are getting better results with an easier approach, albeit anecdotal, then over time, there will be a shift to the new technology without a randomized clinical trial." Fereidoun Abtin, MD, an assistant professor and director of thoracic fellowship in the department of radiology's thoracic section at David Geffen School of Medicine at UCLA, says he was glad to see interventional radiologists diving in to treat inoperable NSCLC. "Despite the challenges faced in this complex cohort of patients, the ablation community has moved ahead with providing this service. These patients have done extremely well from the procedures and have quick recovery to their baseline status within a week or so. Patients rarely need hospital stays and inpatient recovery," he says. "I find this extremely satisfying to see a patient with comorbidities being able to get back to their baseline almost immediately and not be bed bound or restricted for the rest of their life." Interventional radiologists have access to a host of commercially available devices for these procedures, but they cannot be marketed for the ablation procedures because they've not gone through the premarket approval or FDA 510(k) clearance processes, explains Maria Plentl, MSN, vice president of global clinical research for Galil Medical, a maker of cryoablation systems and compatible needles. The company intends to study ablation's use for treating NSCLC, but is currently assessing its worth for treating metastatic cancer to the lungs, she says. It plans doing that in two separate trials: the Eclipse and Solstice trials. "No other companies are putting their research efforts behind the clinical trials and, certainly, that is where we focus our attention," Plentl says. According to Abtin, ablation is most effective when it is aligned with excellent patient management. "Over the years, I have learned the limitations of ablation and the importance of detecting early recurrence of tumor and distant disease, and thereby focus not just on ablating the tumor but [also on] managing the patient like an oncologist," Abtin says. "Hence the term 'interventional oncology' seems appropriate." In Abtin's practice, each case is worked up extensively for nodal and distant metastasis. If the results are negative, the interventional radiologists proceed with ablation. Each patient is then followed using a strict follow-up regimen that includes office visits and imaging to confirm complete ablation and detection of early recurrence either locally or distally. "This allows for me to intervene early in course of recurrence," Abtin explains. "This practice has given recognition and acceptance by my surgical and oncology colleagues, knowing that the referred patients are managed completely and not left without follow-up and appropriate care." Considering the benefits of IGTA, interventional radiologists such as Dupuy state the procedures deserve more attention as an option for treatment of medically inoperable patients with NSCLC. "IGTA, a very attractive treatment option for patients with medically inoperable early-stage NSCLC, with similar overall survival rates compared with SBRT, will always be considered a 'fallback' treatment option without a greater push by the interventional radiology community to create and fund multicenter trials," he wrote in the 2013 JVIR study. Abtin agrees and encourages interventionalists to get their act together. "Ablation data is catching up with larger cohorts, but we have not organized as well as our radiation colleagues," he says. "Radiation oncology has done a great job of providing radiation as the treatment option of choice for these patients and showing results from some well-organized clinical trials." Referring physicians also have to be convinced that ablation is a worthy alternative to radiation therapy, Abtin points out. "Ablation is definitely considered beneficial, but in the minds of referring physicians, it is still invasive," he says. "This same cohort can also be managed with radiation and very often the referring physicians—surgeons, pulmonologist, or the oncologists—perceive radiation as a more definitive option than ablation." Interventional radiologists also should get involved in promoting ablation at their own facilities by participating in or establishing a multidisciplinary tumor clinic, Dupuy suggests. At his facility, medical oncologists, thoracic surgeons, radiation oncologists, interventional radiologists, diagnostic radiologists, and pathologists meet each week at such a clinic in order to review cases of lung cancer. "Each patient receives treatment input from the appropriate physicians and then [patients] make their own decision based on the information they receive," he explains. "Many community hospitals don't have these multidisciplinary clinics and interventional radiologists with the skill set to perform lung ablation and, therefore, no one has an opportunity to see the patient and tell them about IGTA." "The biggest barrier is competing with radiation oncologists who already have the referral pathway," Dupuy adds. "For interventional radiologists to compete, they have to go to tumor boards and discuss the data. They have to talk with pulmonologists and thoracic surgeons and let them know they have a treatment option for patients who refuse radiotherapy or who have contraindications for radiotherapy. Once [interventional radiologists] show they are part of the team, they will get referrals." At a time when interventionalists feel they are competing with radiation oncologists, Dupuy suggests combining these areas for this patient group could be professionally and medically beneficial. "I believe the utilization of IGTA will increase by combining therapy," Dupuy says. "Ablation followed by radiation will provide better local control for larger tumors than any one treatment alone. Combining radiation and IR therapies also will go a long way since ablation causes these professionals to compete for patients. The team approach will certainly foster greater collegiality." Abtin and many in the interventional community say more clinical data are needed to help ablation move ahead. "I am optimistic that ablation will further consolidate and establish itself as an alternative treatment for stage 1 NSCLC in nonsurgical candidates, but we need a well-organized prospective, randomized, clinical trial to evaluate survival, not just small cohorts from institutional trials," Abtin says, adding that studies that focus on technique would be especially valuable. "We also lack the proper understanding of the ablation techniques in vivo," he continues. "These are new techniques in a complex organ, the lung. We are dealing with even a more complex cancer. We do not have enough information on what definitive parameters should be used for optimization of response." When ablation results are published, Abtin believes interventional radiologists need to know more than whether patients had a response or no response. "The relationship of ablation force [ablation work or energy deposited in tissue], tumor type, imaging characteristics, and location has not been studied," he says, "and [it] may not be able to be studied if a multicenter trial is not designed." Trials that study the combination of ablation techniques for treating patients with inoperable NSCLC also would be beneficial. "The combination of ablation and immunotherapy needs further studies," Abtin says. "The effect of tumor ablation on immune response is well known. With rapid progress in immune modulator drugs and therapies, the combination of the two therapeutic options may definitely benefit patients. We just need to establish the proof." The choice to treat inoperable patients with NSCLC with ablation should be based on many factors, according to Sharon W. Kwan, MD, an attending interventional radiologist at Seattle's University of Washington Medical Center. Kwan conducted an economic analysis comparing sublobar surgical resection with thermal ablation and demonstrated lower costs associated with thermal ablation. Her findings were published in JVIR in 2014. Kwan says cost should be a factor, but not the sole factor. 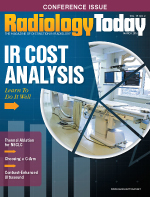 "[Interventional radiologists] would be wise to educate payers and policy makers about the cost-effectiveness of these techniques," she says. "However, I am of firm belief that cost should be one consideration, but never the only consideration when making treatment decisions." Patient preference is also a consideration among a long list of decision factors, Dupuy notes. "The benefits of IGTA vs SBRT are really based on many factors, some of which include patient preference, size and location of tumor, history of previous radiation, the presence of a pacemaker, the ability of the patient to remain motionless for the time it takes to perform the respective procedures, and underlying health care economics," Dupuy says. "In the end, patient preference may carry the most weight. Some patients don't like the idea of placing a needle into the lung while others prefer a single outpatient treatment at lower cost."